The Money You Can't Spend! If you have a 401K plan, an IRA, or other retirement plan, you have money you can't spend. 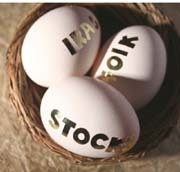 It is probably invested in the volatile stock market or mutual funds, which is also the stock market. If you are lucky, maybe your account value will increase, but many times they do not. Just ask those from Enron, MCI, and many others whose accounts were totally wiped out. There are other types of retirement plans also. If you have one of these more complex plans, call me for assistance to determine if they will roll over into a self directed IRA. It is smart to roll your present retirement account into a self directed IRA, so you can hold California real estate in an IRA. History has shown that holding the right California real estate in a self directed IRA account will yield the results we are discussing here. When I was 26 years old I could have bought a lot in the San Diego Country Estates, which was a new residential development of streets and lots way out in the sticks of Ramona, CA. If I remember correctly, the price for this lot was about $3,000. in 1976. 4 years earlier I bought my house for $23,500., so you can see in comparison that $3K was a lot of money back then. Today the lot is worth about $200,000. or the price is 66.66 times the purchase price. tax for 30 years = $1,050. capital gains tax you need to pay (approx. 26%) = $50,700. tax for 30 years = $11,250. actual net gain = $2,153,000. gross monthly income at 4% interest = $7,177. guestimated income tax @ 15% per month is $1,077. net monthly income = $6,000.